Highly Recommend written by mobile Fast delivery! And received it good condition! Thank you very much! Fast delivery! And received it good condition! Thank you very much! Easy to assemble. Weight is fine to bring outdoor. If kid doesnt know how to ride well yet or control turns, needs to watch out as it is easy to fall off. Chanced upon their showroom and let my child tested the product. She loves it and there are 3 ways to play with it which kept her engaged. Bought and collect it right away. Helpful staff assisted to set up the scooter for my child. Very good product.. abit high for my 83cm tall toddler but he still enjoy playing with it..
Easy to assemble. My 20 month old kid is enjoying the cycle mode. Pedals were in the scooter foot pocket. Items came in good condition. Will definitely recommend. Fast delivery. Quality quite good. Suitable from 2.5 yo. Easy to pick up. Fast delivery. Assembly is neat. Have to read manual, figure out and all things will fit nicely. Kid loves it. Item received today fast delivery and nice. Very good 3-in -1 design and functional. 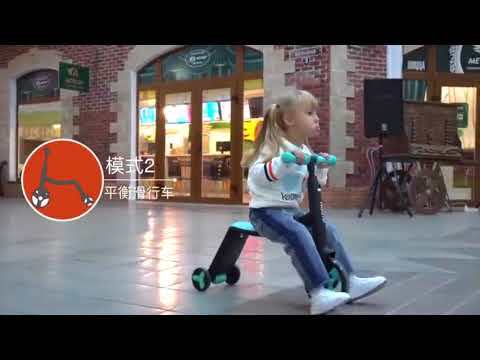 Can you check why in the bicycle mode, when kids riding the wheel not moving at all. Only the 2 rides are moving. For scooter related enquiries, kindly forward this message to 81616271 via WhatsApp. Our scooter team will help you with any inquiries! Will the blue one be restocked? It will take around 4 weeks to restock. when will the red and green restock?? Suitable age for it? 5 yrs old? It is suitable for a 5 years old child. As it allows standing and sitting riding, it can dependent on the height as well.